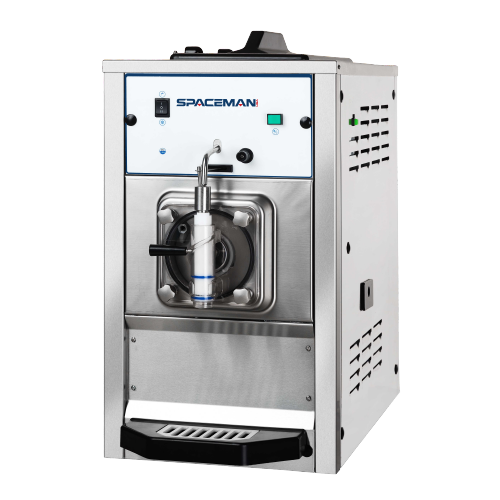 The Spaceman 6450 – Low Capacity, Single Flavor Counter Top Non-Dairy Frozen Beverage Machine is Ideal for Frozen Beverages, Slush Beverages, Margaritas, Smoothies, Shakes and Frozen Coffee Drinks! The Spaceman 6450 is the perfect addition to any business looking to add slush or granita options to their menu. This frozen beverage model is not approved for dairy, so it is also a great option for nightclubs and bars that want several machines to offer various frozen alcoholic drinks, such as margarita or daquiri. It’s compact design and economical price point is also a sensible choice for gas stations, delis and restaurants, or small catering opportunities. 110V connection is easy to run in mobile applications, or event venues. Patented freezing technology makes for a super fast recovery time in the 4qt cylinder, producing 16 qts/hr or 64 drinks every hour. Vary your menu by offering shakes & smoothies or frozen cocktails, fruit juices, coffees, cappuccino and tea slush beverages, all served at the desired thickness. This machine is NOT intended for products that contain dairy. Specially designed viscosity control automatically maintains superior product quality. Adjustable control allows the operator to serve a wide variety of frozen beverages at the desired thickness.